Some years ago, I became disenchanted with the notion that TDD uses tests to "drive" design in any meaningful way. I came to notice two things: first, that the tests were just as happy to pass whatever cut and paste hack served as "the simplest thing that could possibly work", second that all of the refactoring patterns are reversible. So what is being test infected buying me? One interesting constraint on tests is that we want them to be reliable. If the test subject hasn't changed, then we should get the same collection of observations if we move the test bed in time and space. This in turn means we need to restrict the tests interaction with unstable elements -- I/O, the clock, the network, random entropy. Our test subjects often expect to interact with these elements, so within the test environment we need to be able to provide a substitute. So one of the design patterns driven by testing is "dependency injection". Somewhere recently I came across the spelling "configurable dependency", which I think is better. It helps to sharpen my attention on the fact that we are describing something that we change when we transition from a production environment to a test environment, which in turn suggests certain approaches. But we're really talking about something more specific: configurable effects or perhaps configurable non-determinism. The test itself doesn't care much about how much buffer surrounds the effect; but if we allow test coverage to influence us here, then we want the substituted code to be as small as we can manage. To lean of Gary Bernhardt's terminology, we want the test to be able to control a thin imperative shell. But then what? We can keep pouring inputs through the shell without introducing any new pressures on the design. I came across this recently, and it helps. A key problem with the outside in approach, is that the "costs" of setting up a test are disproportionate to the constraint we are trying to establish. 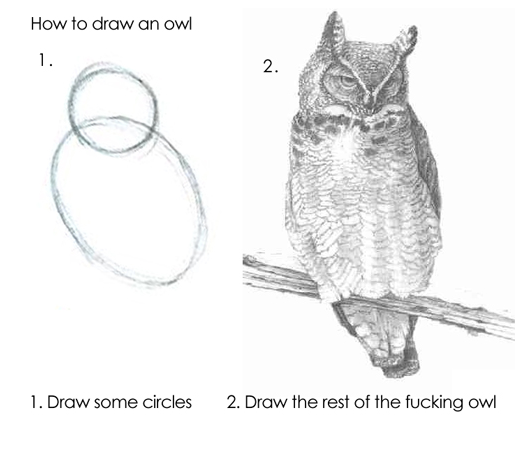 Composition of the test subject requires us to draw the rest of the owl when all we need is a couple of circles. To borrow an idea from Dan North, testing all the way from the boundary makes for really lousy examples, because the noise gets in the way of the idea. The grain of the test should match the grain of the constraint it describes - if the constraint is small, then we should expect that the composition will have low complexity. What we have then, I think, is a version of testing, the human author applying a number of heuristics when designing an automated check to ensure that the subject(s) will exhibit the appropriate properties. In other words, we're getting a lot of mileage out of aligning the test/subject boundaries before we even get to green. The kinds of design improvements that we make while refactoring? There is definitely a family of refactorings that are motivated by the idea of taking some implementation detail and "lifting" it into the testable space. I think that you can fairly say that the (future) test is influencing the design that emerges during the refactoring. I'm not convinced that we can credit tests for the results that emerge from the Design Dynamo. My current thinking is that they are playing only a supporting role - repeatedly evaluating compliance with the constraints after each change, but not encouraging the selection of a particular change. I believe software design should be taught before TDD. TDD can’t lead to good design if we don’t know what good design looks like. Mark Seemann: The TDD Apostate. Michael Feathers: Making Too Much of TDD.